In the 1940’s, an assortment of small farms made up the area which is now Grace Farms. The agricultural practices of the 19th century formed the land divisions in New Canaan, Connecticut. Throughout the next 70 years, as agriculture started losing its importance in the area, much of the scenery was covered by growing woodlands. The property was acquired by Winsome farms in 1991 who turned the small farm and private residence into an equestrian facility - which sounds like quite a bit of fun! More land was added to the property for a harnessed exercise ring, a 30,000 square foot barn with 52 stall and other functions. After Pacific Farms scooped up the grounds in the early 2000’s, it was transformed into 10-lot developments. 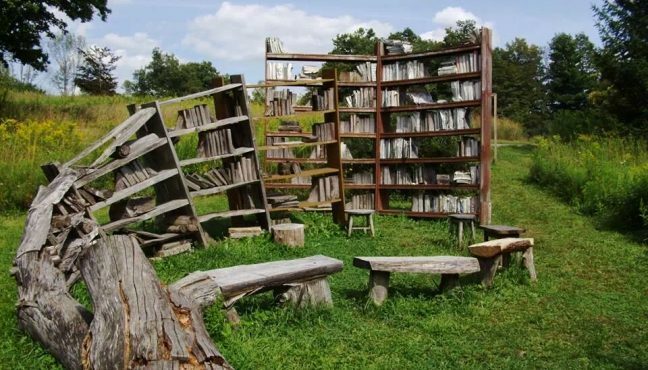 Thankfully, Grace Farms Foundation (established in 2009), which supports the arts, nature, community, justice and faith, has preserved the beauty and nature of this property. Featuring paddocks, barns, wet meadows and field trees, the plot remains of the the rare landscape gems of Fairfield County. 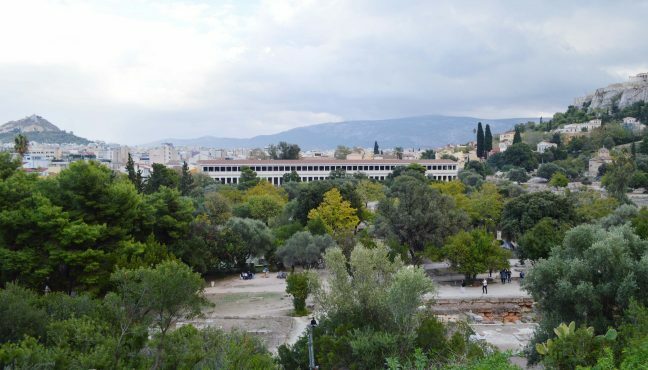 The 80-acre land, which is now owned by the Foundation, grants permission to organizations and individuals, both nationally and internationally, to gather and collaborate. 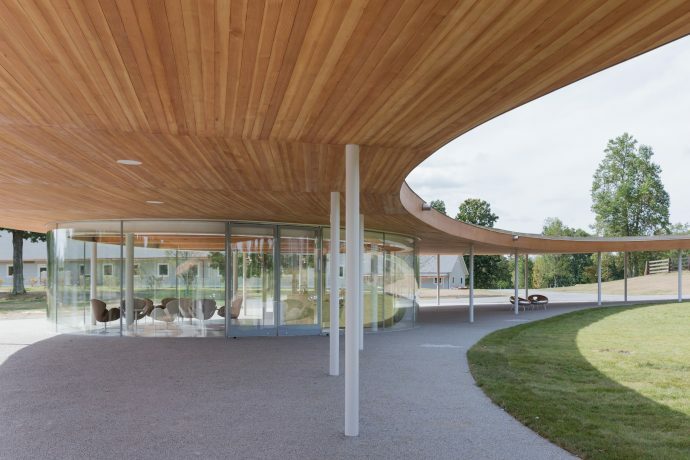 The facilities of the Grace Farms are accessible and available to the public which allows a community to continue shaping and working together for the better. 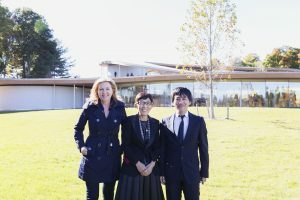 SANAA, an award-winning Tokyo-based architectural firm, has beautifully created a new building for Grace Farms, which naturally merges into the lush landscape. A place where people can freely explore and share their faith, the arts, the community, and even pursue justice. We know what you must be thinking..
Why aren't there more places like this ?! Museeum strongly agrees and was very excited to get some more information and details from the Grace Farm Foundation itself. What was the goal behind building this new project? 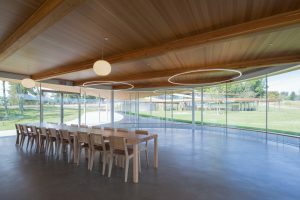 Grace Farms is a new cultural and community center with five programmatic initiatives in New Canaan, Connecticut, owned and operated by the Grace Farms Foundation. 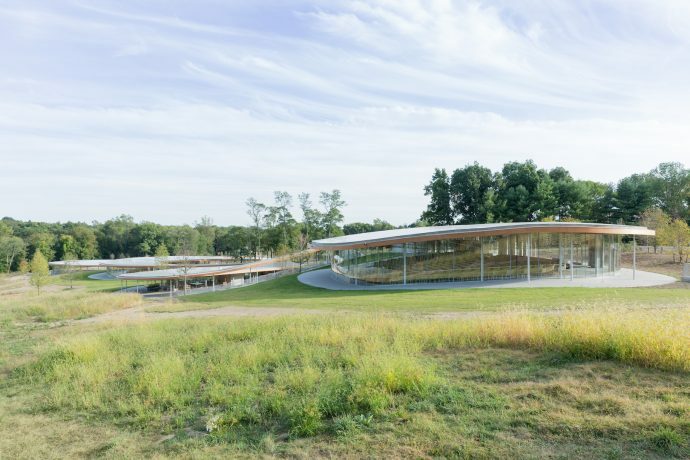 Grace Farms opened to the public on October 9, 2015. 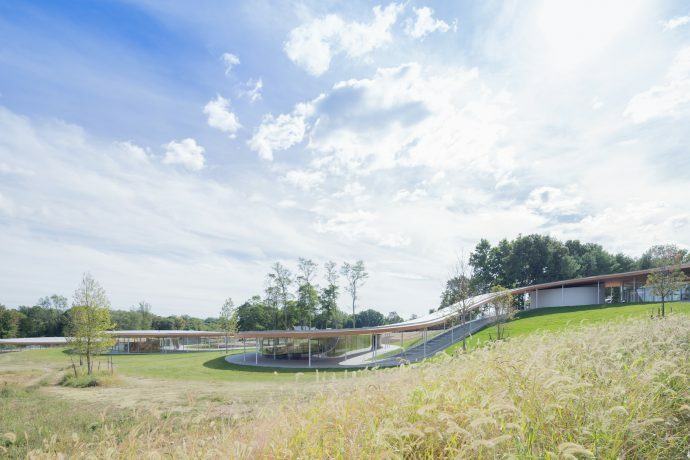 Comprised of a multipurpose building called the River and 80 surrounding acres, Grace Farms was created as a gift of open space for people to experience nature, encounter the arts, pursue justice, foster community and explore faith, and encourages participation on a local, national and global level. 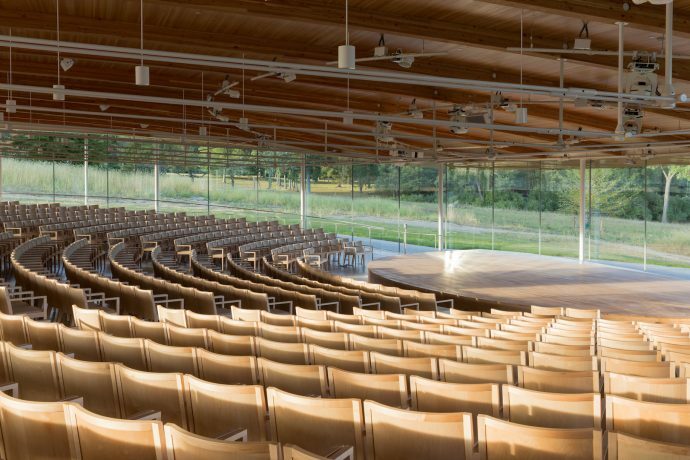 Grace Farms offers a wide range of programming, including discussions, intimate concerts, family-friendly art classes, curated cultural projects, tea services and other events. How did you feel that SANAA would be the right studio to collaborate with in this venture? 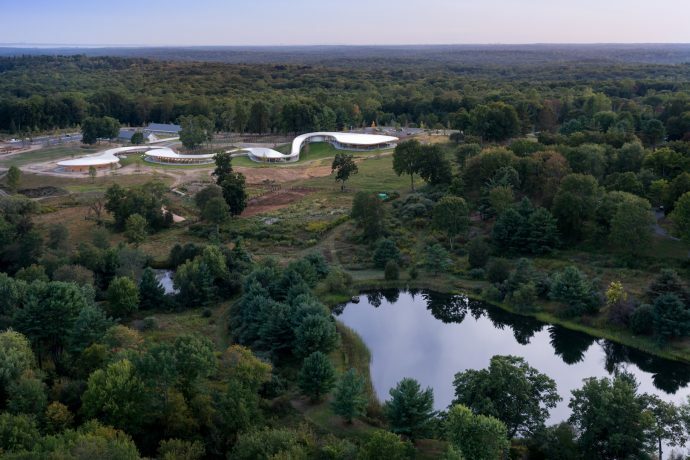 Grace Farms Foundation selected SANAA because of their incredible sensitivity to place and ability to create a building in harmony with nature. 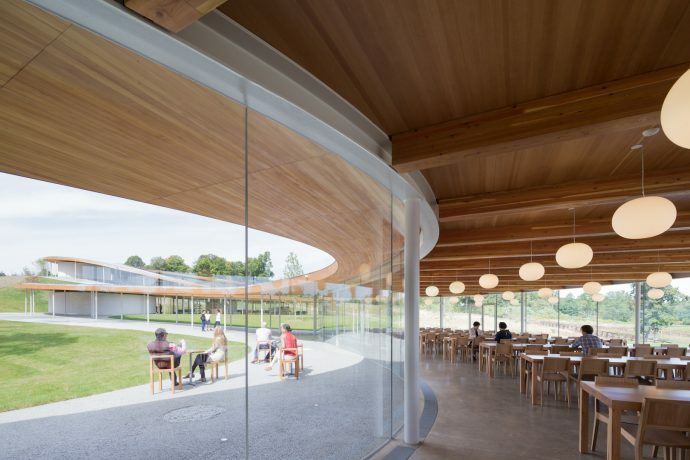 Sejima and Nishizawa’s vision of architecture and their seamless integration of inside and outside aligned closely with the purposes envisioned for Grace Farms. Tell us more about their choice of material and design. What are some of the most exciting details? 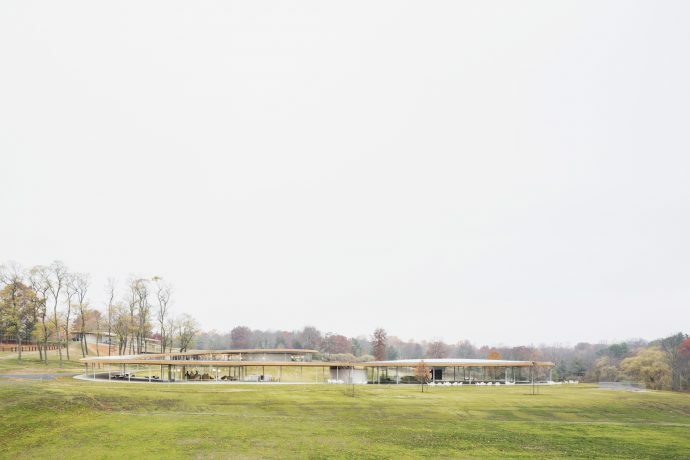 Grace Farms Foundation wanted a building that would blend in with the natural surroundings and draw people into the landscape. 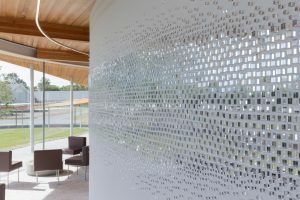 SANAA’s generous use of glass allows people to connect and engage with each other and with nature, and to feel a part of something that can be experienced individually or as part of a community. 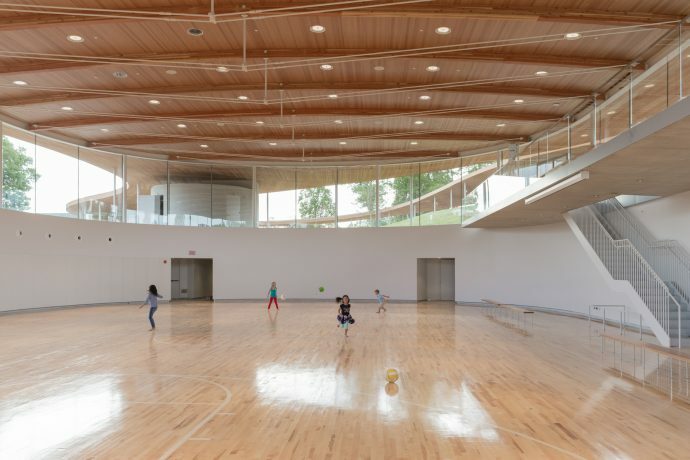 Wood–red oak and maple–was integrated as a natural element to evoke warmth and a sense of place.The roof structure is built with straight lengths of Douglas fir timbers, which are connected in a long, continuous curve. 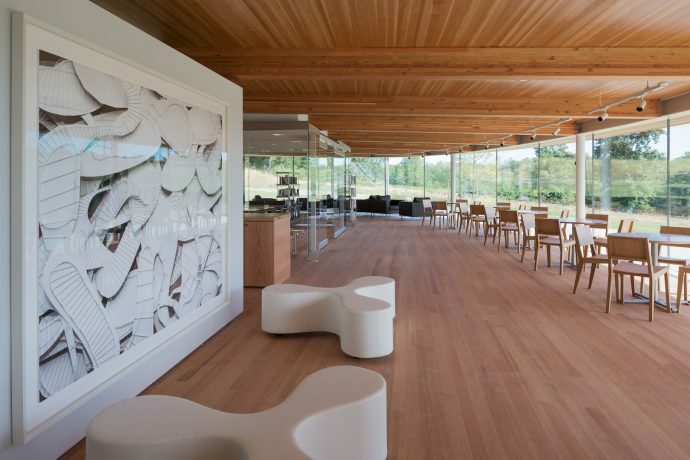 Additionally, some the furniture SANAA created for Grace Farms was made with wood from trees milled on site. 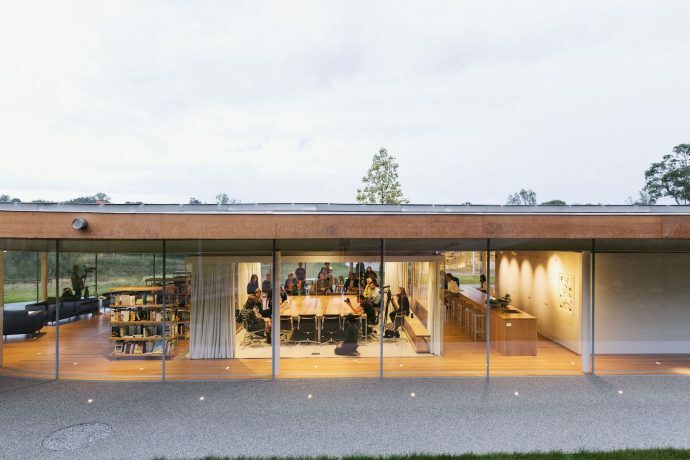 The building is said to be inspired by a river, could you tell us more about what this means to Grace Farms? 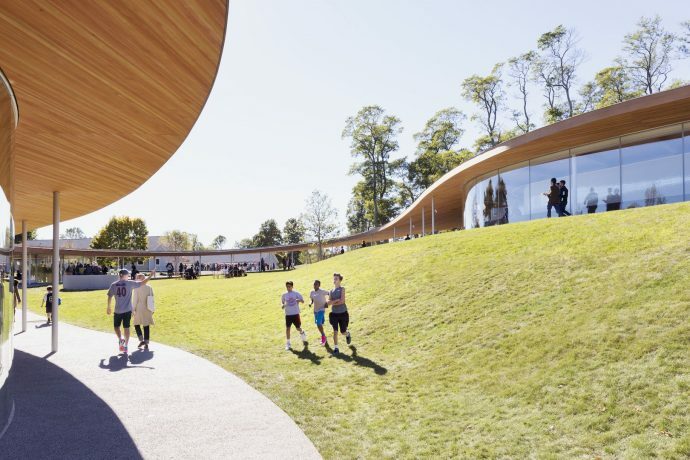 Actually, the shape of the three-dimensional expression of the vision of Grace Farms winding down the slope of the terrain is what prompted us to call SANAA’s design, the “River”. 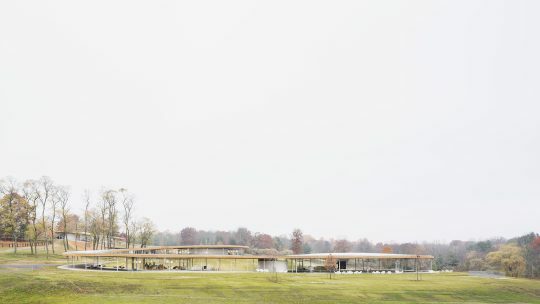 The River building’s low profile follows the existing contours of the land while meandering down the long gentle slope that has a 44-foot change in elevation. 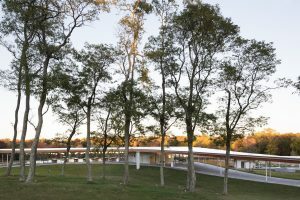 The covered walkways that connect the building’s five volumes shield one from the weather, but also allow a more direct interaction with the landscape throughout the year. The cultural center is made up of 5 pavilions; does each serve a different function or meaning? 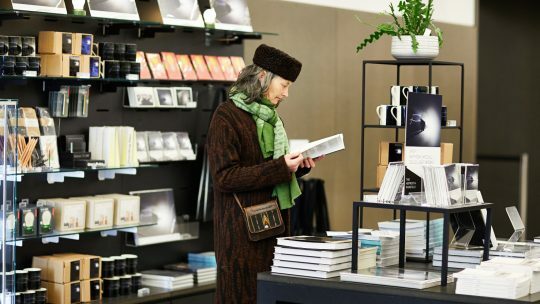 Library: a staffed library with resources to research justice, the arts, nature and faith. It includes a glass-enclosed conference room and fireplace for discussion and hospitality, as well as Grace Farms Foundation offices. 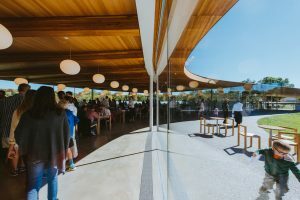 Commons: a dining room and living room, with capacity for 300, with communal tables built from trees harvested on-site, a coffee bar, sofas and fireplace, offering hospitality and expansive views. A lower level accommodates a lecture hall and ancillary spaces. The landscape seems to be the main focus here, you have brought OLIN on board to work on this. Could you tell us what their approach was to create such a serene landscape? Grace Farms is a place where people can experience the peace and beauty of nature. 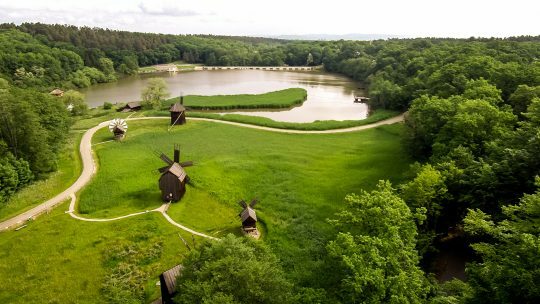 Approximately 77 of the 80 acres of Grace Farms are being retained in perpetuity as open meadows, woods, wetlands and ponds. SANAA developed the landscape design for Grace Farms with OLIN, preserving and enhancing the native flora and fauna while integrating community gardens, athletic fields, and trails. Just looking at the center evokes a very calm and peaceful feeling. How does faith play a role in this design and space, as a center of art, faith and justice? 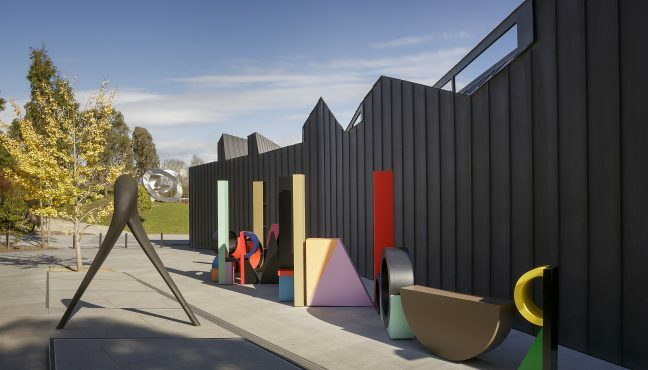 Our design request was to create a building that inspired both peace and curiosity, and that would enhance the experience of nature and provide a welcoming environment to foster community. Sejima and Nishizawa gave the Foundation all of that and more. 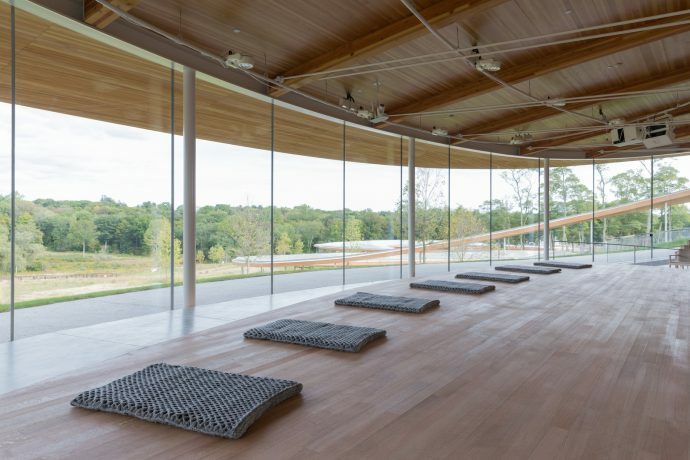 Today, Grace Farms is a peaceful, natural environment where people of all faiths, and no faith at all, can undertake journeys toward truth about God and human flourishing, introspectively or in dialogue with others. Foundation programming includes classes and discussions, library resources and the gift of space to organizations—including the local, non-denominational Grace Community Church—that align with the initiatives of Grace Farms Foundation. How are these 3 subjects approached within the development of the project and how do you feel they have come through? 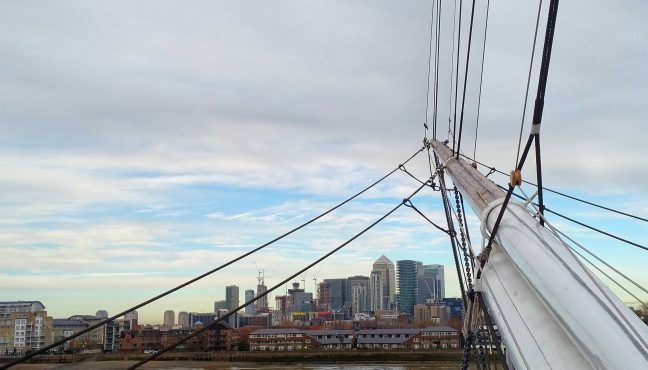 The Foundation’s five mission areas (nature, arts, justice, community, and faith) are at the core of everything that the Foundation does and were guiding principles for the development of the property. 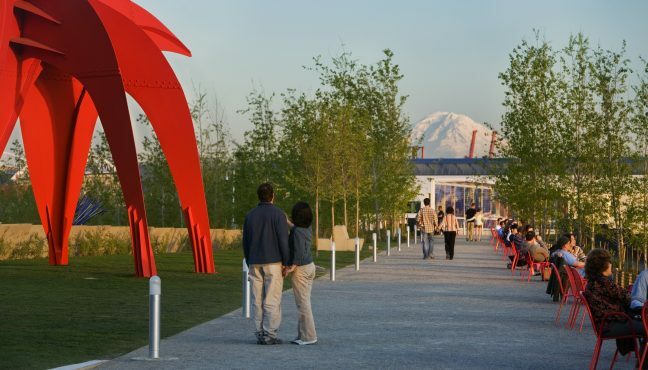 The open space and the architecture offer the opportunity for interaction and dialogue among a diverse community of people, both locally and globally. 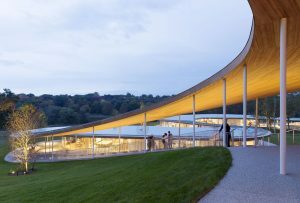 Grace Farms gives people opportunities to experience nature, encounter the arts, pursue justice, foster community and explore faith, and encourages participation on a local, national and global level. 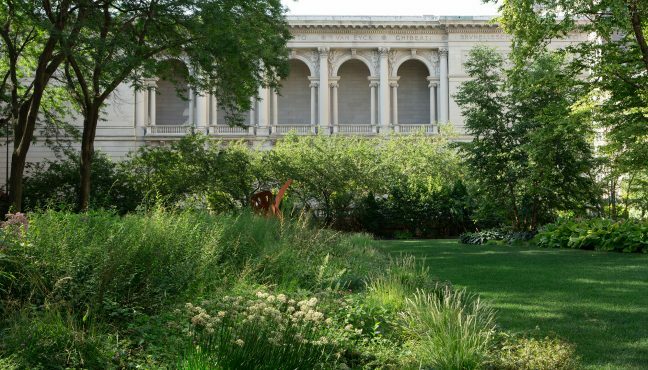 What does this space provide to the visitors and how do you feel it has been used and explored by them? 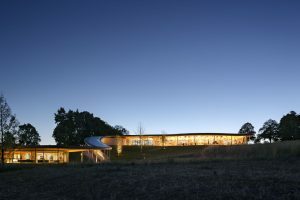 Grace Farms offers a wide-range of structured and unstructured programming, including lectures and conversations in the Sanctuary, public reading hours in the Library, pick-up basketball and volleyball in the Court/gymnasium, simple tea services in the Pavilion, as well as and year-round public recreational areas, including walking trails, picnic areas and a barbecue pit. As a nexus for like-minded non-profits (ranging from Arts for Healing to International Justice Mission to our Justice Initiative), Grace Farms serves as a brainstorming and launching hub to enable their work to flourish. Grace Farms is a place for everyone – it is a place where diverse communities join together for good, creating unexpected outcomes. 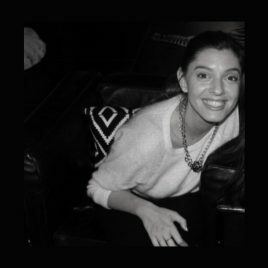 With an engage-as-you-choose approach, Grace Farms not only opens its doors to neighbors in Connecticut and New York towns, but also extends the invitation nationally and globally. 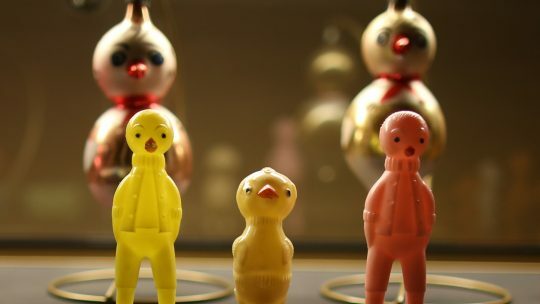 You have had some very interesting collaborations with artists, such as Kysa Johnson. How do these collaborations come to life, what do you look for? We’ve been able to present over 150 artists in over 7 disciplines since we opened in October, which is thrilling for us. Art is this dexterous and yet capacious thing, with an uncanny ability to say the unsayable, to reach the unreachable. These expressions come in handy when faced with issues that Grace Farms is tackling, such as eradicating child trafficking. 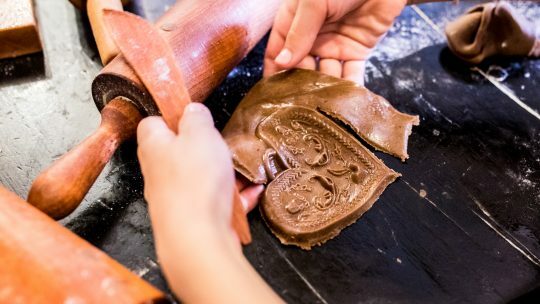 The Arts Initiative at Grace Farms seeks to bring the role of the arts and of the artists themselves to bear in the various contexts addressed by the nature, community, justice and faith initiatives of Grace Farms Foundation. 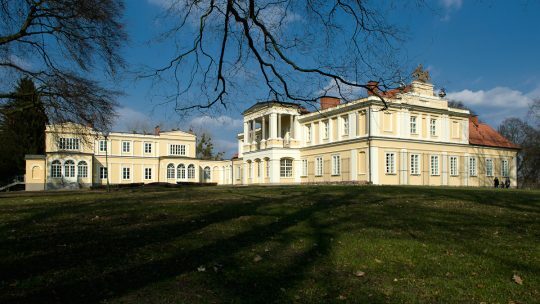 The visual, literary and performing arts work that happens here is new, collaborative and site-specific (responding to the place and vision of Grace Farms), and welcomes the processes of certain artists, particularly those who are already in a global discourse on topics such as meaningful life and human flourishing. The artists that are invited to Grace Farms tend to be process driven, rather than product driven, and inherently collaborative, willing to discover unexpected outcomes. What interesting plans and collaborations can we be expecting of you in the future? 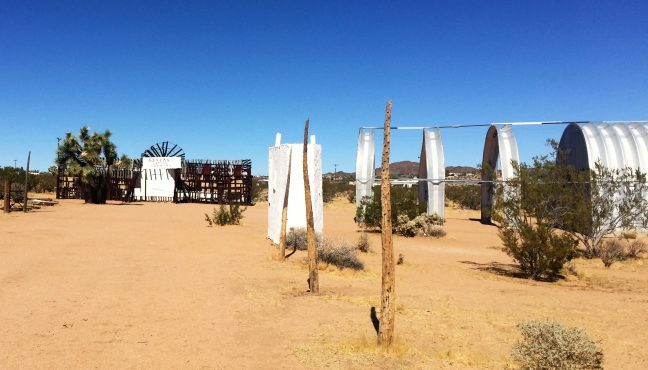 One of the most interesting and potentially powerful programs of the Arts Initiative is the Practicing series, in which diverse groupings of artists are invited to respond creatively to an ethical or spiritual practice. 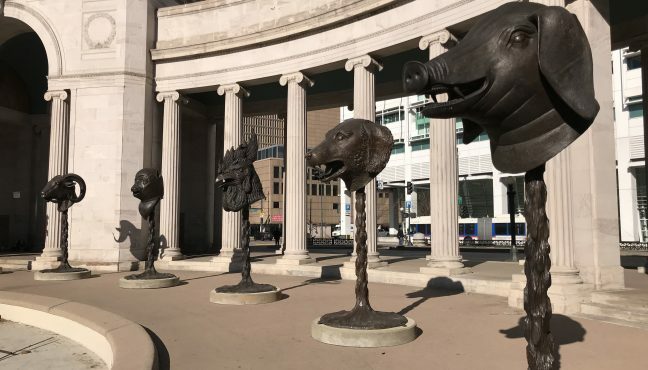 The idea is based on a query: what can the artistic and collaborative process teach us about how to embody a particular practice, such as empathy or silence, awe or joy? For several days of dialogue, workshop and rehearsal, participants are intensely engaged from an artistic, scholarly and spiritual perspective. In July, we will be exploring Awe as an ethical practice essential to healthy human development, inspired by the work of Dr. Dacher Keltner of UC Berkeley. Joining us will be some truly awe-inspiring artists, Gallim Dance of Brooklyn and composer and performer Cindertalk as well as soprano Nola Richardson and counter-tenor Daniel Moody (Yale Voxtet). There will be a free public showing of the subsequent new work on July 30th. The performance will be followed by a Q&A with the artists.